Ministers have set out a full timetable for the rollout of benefits run by Scotland's new social security agency. 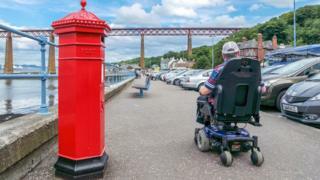 Holyrood is taking over responsibility for 11 benefits, including disability living allowance, personal independence payments and carers' allowances. Overall responsibility for all of these welfare payments will sit with the Scottish government from April 2020. But opposition MSPs highlighted that the full transfer of cases and payments might not be complete until 2024. Social Security Secretary Shirley-Anne Somerville said it was "not simply a case of turning off one switch and turning on another", saying the shift must not "put people's payments at risk". Legislation laying the groundwork for the new welfare agency was passed in 2018, and its headquarters was established in Dundee. The first payments of two new benefit, the carer's allowance supplement and the "best start grant" for pregnancy and birth payments, were made in 2018. The minister told MSPs that the timetable was "ambitious but realistic", and would "protect people and their payments" at all times. However, she added that transferring more than half a million cases from the Department of Work and Pensions was a huge task, saying that it could take until 2024 to complete this. Opposition parties were quick to pick up on this, with Conservative MSP Michelle Ballantyne accusing the SNP of "utter hypocrisy", having used "highly charged language on the UK government's administration of benefits". Labour's Mark Griffin said the government should "apologise to everyone in Scotland entitled to social security who is being left at the hands of the Tories". And Lib Dem social security spokeswoman Caron Lindsay said the timetable "makes a mockery of the SNP's claim to be able to set up a new country in 18 months". Ms Somerville hit back that the move was "breaking new ground", and was "the most complicated feat of devolution attempted since this parliament was reconvened". Meanwhile, Green MSP Alison Johnstone said she was "delighted" that ministers had pledged to reduce the number of "cruel, humiliating and entirely unnecessary" face-to-face assessments.